Integrated with MQL in selected cases. Drilling CFRP, CFRP stackups, and composites with CO2 cooling is becoming increasingly popular. Especially with the increase in use of composite materials in aerospace and automotive applications, composites will continue to grow at a very high rate due to the high strength and low weight of the materials. 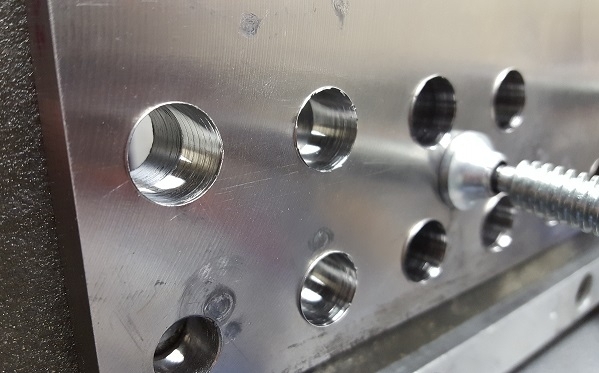 One key problem manufacturers have using this material is the ability to efficiently drill holes through the layers to install fasteners and other components. This is especially true in stackups of Carbon Fiber Reinforced Plastic (CFRP) and titanium (Ti) due to the desire of drilling CFRP dry for the CFRP layer and the need for cooling when drilling the high strength Ti layer. By using carbon dioxide, or CO2, through tool cooling agent, it is possible to protect both layers. There are significant benefits of CO2 cooling in CFRP-Ti stackups including: 30% productivity increases, 10% tool life improvements, and substantial energy savings. • PCD tooling can provide additional production and cost advantages. Study shows multiple benefits of CO2 cooling in composites drilling – SAE International – Article is based on SAE International technical paper 2014-01-2234 by Nelson W. Sorbo and Jason J. Dionne, both of Cool Clean Technologies.